The day has come… It’s the Day of the Dead! But this time, you’re the Macabre! 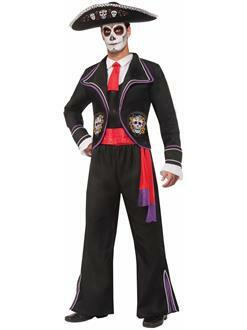 This Day of the Dead Macabre Costume in black with red and colorful accents will have all the attention on you. I comes with a shirt, attached tie, a vest, and a jacket with attached cuffs. To take this costume over the top, it includes a red belt sash and a tie. Bring the music to life, with this Day of the Dead costume.